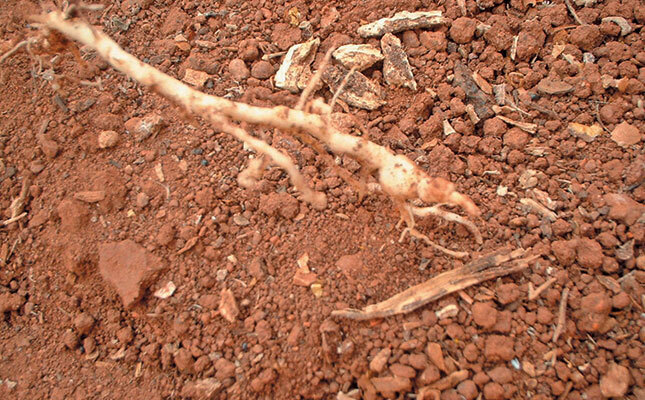 Home » Crops » Vegetables » Can marigolds control eelworm? When I first began planting tomatoes in soil in tunnels, the soil was infested with eelworm, which killed susceptible varieties before they could even start producing. The eelworm on this plant substantiates researchers’ claims that marigolds grown as a companion crop are of no value against eelworm. I wanted to avoid using chemicals if possible, but had little success with various ‘biological’ products. Then I remembered reading that marigolds control eelworm when planted as companion plants. Although I was aware that many of the claims made about ‘companion planting’ had been debunked and the practice was of value only in rare cases, I asked the Agricultural Research Council to track down studies on the use of marigolds to control eelworm. It emerged that marigolds are indeed effective at combating most species of eelworm from the soil, but not in the way suggested by many gardening books. Firstly, only certain varieties of the French marigold (Tagetes patula) control eelworm. One of these is the dwarf French marigold, Tangerine, which is popular and widely available. Khaki weed (T. minuta), by contrast, while often considered useful at ridding a land of eelworm, is actually quite ineffective. Secondly, many gardening books claim that eelworms are repelled or killed by exudates given off by marigolds. They therefore suggest planting marigolds between susceptible crops. This is misleading advice. Researchers have found that marigold roots do give off toxic chemicals that suppress eelworm larvae hatching from the eggs. But for this to be as effective as some sources claim, marigold roots would have to intermingle in great numbers with the companion plant’s roots. Put another way, to have any significant effect, the marigolds have to be as numerous as uncontrolled weeds – to the extent that they suppress the companion crop through competition! In addition, as will be seen later, the eelworm eggs must actually hatch before effective control can take place. In one study, scientists planted susceptible tomato plants in eelworm-free pots, then planted marigolds with the tomatoes in half of the pots. A measured number of eelworm larvae was then added to each pot. It was found that the eelworms vigorously attacked the tomato plants even when marigolds were present. In fact, the eelworm population actually increased. This would seem to rule out any benefit of marigolds as a companion plant, especially as marigolds are also host to thrips and spider mites which can attack crops growing alongside. When I planted marigolds in a tunnel after a crop of tomatoes that were susceptible to eelworm, a number of volunteer tomatoes were growing among the thick mass of marigolds. When I removed these, I found eelworm damage to the roots, confirming what the researchers had discovered from the pot experiments. Marigolds are effective – watch this space! By now, you would be forgiven for thinking I have contradicted myself, and that marigolds are of little use for eelworm control. In fact, they are extremely effective against a host of eelworm species. The mechanism by which this is accomplished will be discussed in next week’s issue.